The Retinal Diagram window is where the shape of the tumor base and other anatomic landmarks of interest are digitized. Photographs of the inner surface of the eye can be displayed in this window to assist the digitization. This window is also where the height and shape of the tumor is entered, muscle insertions are estimated, the plaque is positioned and suture coordinates on the scleral surface are calculated. In fact, most of the decisions required in treatment planning are made here. A retinal diagram is a 2D polar map of the retinal surface, in cartography it is referred to as an azimuthal equidistant projection. All points on such a map are at proportionately correct distances from the center point, and are also at the correct azimuth from the center point. 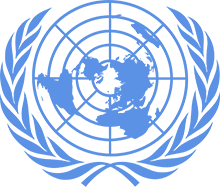 The flag of the United Nations contains an example of a polar azimuthal equidistant projection with the north pole at its center. The standard Posterior retinal map is centered at the posterior pole of the eye. The radial spokes are meridian lines which extend to the limbus. The circles, in expanding order, represent the equator, ora serrata, and the limbus. In Plaque Simulator, the standard retinal diagram is modeled as being an oblate spheroidal surface 1 mm inset from the outer surface of the sclera. The tic marks on the diagram are spaced at 1 mm of arc increments. Plaque Simulator suture coordinates are a 2D coordinate system on the outer surface of the sclera. A suture coordinate consists of a meridian plane (analogous to earth longitude), expressed as either a clock hour or a toric axis marker angle, and a chord distance along that meridian, measured from the limbus circle. For example, in the illustration on the right, using the default clock hour method, the coordinates of the sutures are at (2:39,13.5 mm) and (4:09,13.0 mm). 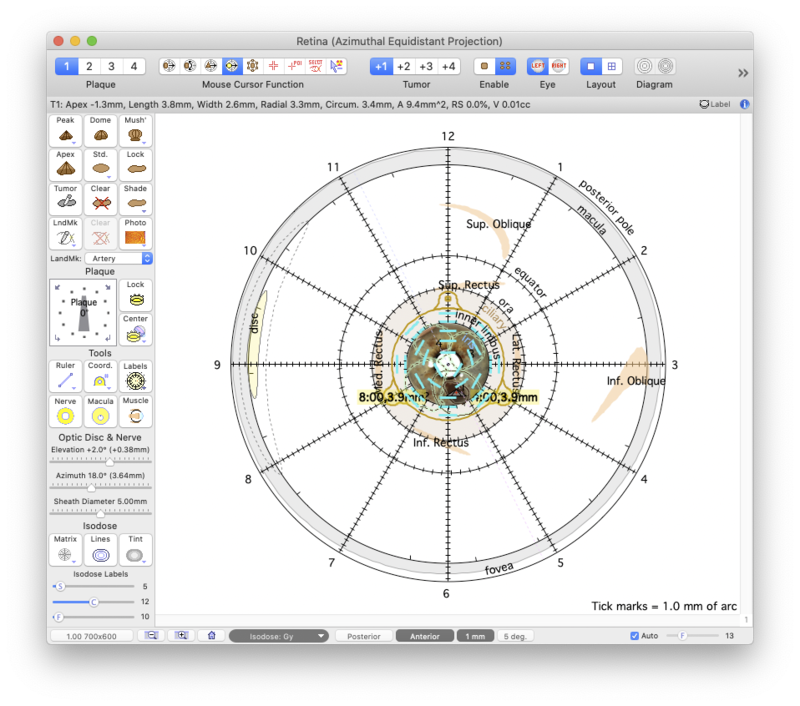 Using the optional axis marker method, those same coordinates would be expressed as the azimuthal angle and caliper distance pair (11°,13.5 mm) and (145°,13.0 mm). 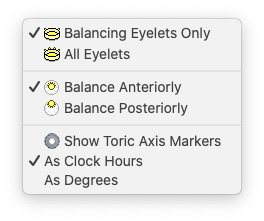 The Retinal Diagram Document prints both clock hour and angular versions on separate pages for reference during surgery. The alternative Anterior map is centered on the pole of the oblate anterior surface of the eye as defined for the posterior projection. As in the posterior projection, this oblate surface is modeled as being 1 mm inset from the outer surface of the sclera from the posterior pole to the limbus and the curvature is then extrapolated from the limbus to the anterior pole. The radial spokes are meridian lines which extend from the limbus to the posterior pole. The circles, in expanding order, represent the limbus, ora serrata, equator, macula, fovea and finally the posterior pole which distorts to form the outermost circle. The tic marks on the diagram are spaced at 1 mm of arc increments. 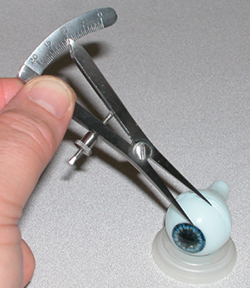 The anterior projection is used when working with iris and ciliary tumors. In practice, the surgeon first marks the meridian lines on the sclera either from experience or by using a toric (azimuthal) axis marker, then, using a Castroviejo caliper, the suture points are marked at 13.3 and 12.8 mm from the limbus along the paired meridian line. The toolbar buttons near the top of the window select which tumor is currently being edited, cursor function, enable multiple tumors, and select between left and right eye. Plaque simulator supports up to 4 tumors per plan. Only one of these tumors is "active", or "editable" at any times. In most instances you will simply use tumor #1 for planning, with tumors 2..4 reserved to create complex shapes or to be used as retinal regions of interest. Plaque 1..4 - Selects the plaque (and its associated dose matrix) that is currently "active". When enabled, click the cursor on the tumor to drag it on the diagram. The command and control keys rotate the tumor while dragging. Sets the cursor mode for rotating the active tumor. When enabled, click the cursor on the tumor apex to drag it on the diagram. When enabled, click the cursor within the projected outline of the plaque to drag it on the diagram. While dragging (ie the mouse button remains down), the plaque will initially rotate to keep the eyelets balanced towards the limbus until you press the option key or invoke manual keyboard rotation by pressing either the command (cw) or control (ccw) keys. Once auto-balancing is disabled, it will remain disabled for the duration of the drag. When enabled, the tumor margin becomes editable. The current spherical polygon auto-margin implementation only works properly for tumors with convex perimeters. You can manually drag margin handles to adjust the margin for concave perimeters. When enabled, the next cursor click on the diagram digitizes a point of interest. Sets the cursor mode for selecting landmarks for some future action. Sets the cursor mode for loading and unloading of sources into plaque placeholders. Tumor 1..4 - Selects the tumor that is currently "active" and editable. Sets the window layout to display only the "active" plaque as determined by the plaque button. Divides the window layout into 4 panes to display all four plaques. The pane of the active plaque is bounded with a thicker black frame. Layout - Selects between single and four pane display. The controls in this group apply to tumor digitization and shape. Buttons with small triangles in the lower right corner also include a contextual menu which lists options for that button's function. Contol-clicking (note: the rightmost button on a multi-button mouse is usually equivalent to a "control-click" in MacOS) on these buttons displays the menu. Peak - the tumor has a conical peak-like shape. Truncated Cone - the tumor is a truncated conic which is clipped at the apex height. The height of the missing conic peak defaults to 20 mm but can be customized in the Custom Shape... sheet. Constant Thickness - the tumor has constant thickness defined by the apex height. Dome - the tumor is domed shaped (default). Mushroom - the tumor is mushroom shaped, the popup menu further refines the shape. Stem - the tumor has a generic mushroom-like shape with a stem. Ball - the tumor has a generic ball or button-like shape. Custom Shape... - opens a dialog sheet that permits more precise customization of the tumor shape. Apex - opens the Tumor Apex modal sheet to enter the tumor height, usually determined from ultrasound images, and set the PTV margin surrounding the base. Std. - opens the Standard Tumor dialog to create a tumor with a circular or elliptical base. Lock - lock the active tumor location. Tumor - begin digitizing the base perimeter of the active tumor. Clear - delete the active tumor perimeter. Shade - tint the tumor perimeter. Photo - map a fundus photo collage onto the diagram, the popup menu adjusts the appearance of the fundus collage. Auto Correct Collage - when enabled, the fundus collage is circumferentially warped to display correctly on the retinal diagram. Transparent Background - makes fundus collage pixels of the selected color (e.g. black or white) transparent when mapped to 2D and 3D surfaces. The color to make transparent is set in the Image Window when calibrating the fundus image. Photo slider - eliminates the fundus photo backgound. Landmark - enables landmark digitization. Select All - Select all landmarks for a subsequent action such as deletion. Deselect all - Deselects all landmarks. Properties... - Opens the landmark properties sheet. Clear Landmark - deletes any currently selected landmark(s). LandMk menu - selects current landmark type. Artery - Subsequent landmarks are tagged as type artery. Vein - Subsequent landmarks are tagged as type vein. Other - Subsequent landmarks are untyped - useful to mark areal regions. The controls in this group adjust basic plaque location which is sufficient in most instances. For greater control over plaque location, offset and orientation use the 3D Setup window and its helper windows. Plaque - rotate the active plaque. Lock - lock the active plaque location. Center - center the active plaque on the active tumor and balance the plaque eyelets. The controls in this group apply to diagram appearance and the digitization of retinal landmarks. Buttons with small triangles in the lower right corner also include a contextual menu which lists options for that button's function. Contol-clicking (note: the rightmost button on a multi-button mouse is usually equivalent to a "control-click" in MacOS) on these buttons displays the menu. Ruler - displays a distance measuring tool on the diagram. The ruler measures the chord or arc length between any two points on the diagram. The ruler is primarily used to measure tumor size and dosimetric margins around the tumor base. To use the ruler, simply drag the handle at each end to the desired position, or drag the distance indicator at the ruler center. Properties... - Opens the ruler properties sheet where you can customize ruler properties and enable multiple rulers. Coord. - displays scleral suture coordinates for the eyelets. For Balancing Eyelets Only - Show coordinates only for the balancing eyelets. A pair of balancing eyelets is used to auto-center and orient the plaque for easiest surgical placement. The balancing eyelets are also (usually) the eyelets that will be used to attach the plaque to the sclera. 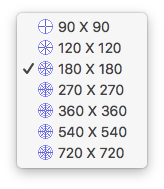 This is the recommended display setting. All Eyelets - Show coordinates for every suture eyelet. Show Axis Markers - Show axis marker settings on the diagram. As Clock Hours - Meridians are expressed as clock hours. As Degrees - Meridians are expressed as toric axis marker degrees. Labels - displays 1 mm tic marks and other labels on the diagram. Seed Strength - Enable to show seed strength overlays similar to those displayed in the plaque loading window. Useful primarily when loading a plaque with multiple seed strengths. Disabled by default. Slot Index - Enable to show seed slot index overlays. Useful primarily when loading a plaque with multiple seed strengths. Disabled by default. Nerve - projects the myelin sheath surrounding the optic nerve onto the diagram. This is the closest that a plaque and/or its notch can physically be placed adjacent to the disc without pressing on the nerve. PS will alert you to plaque collision with this projection. Macula - outlines the macular region. Muscle - projects muscle insertions onto the diagram. Muscle labels can be disabled in the Diagram Options menu. 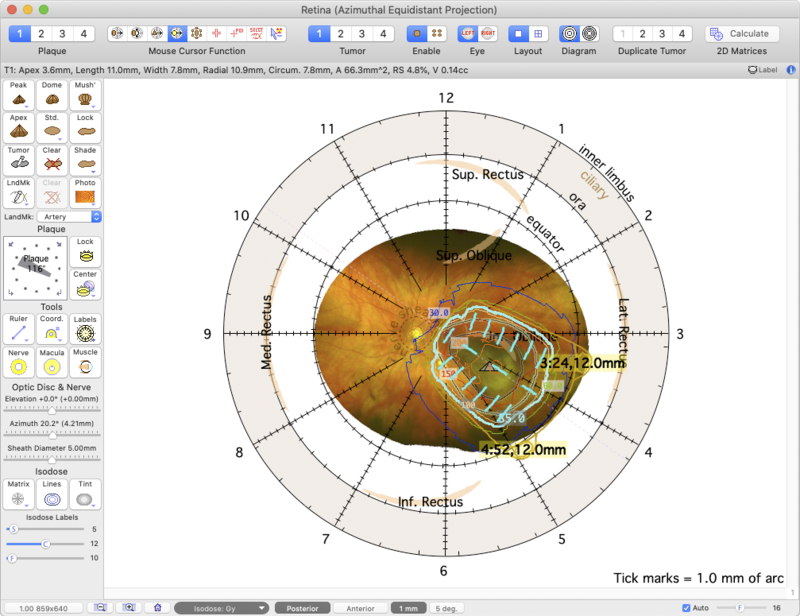 The controls in this group apply to the appearance of isodose maps on the retinal diagram. Buttons with small triangles in the lower right corner also include a contextual menu which lists options for that button's function. Contol-clicking (note: the rightmost button on a multi-button mouse is usually equivalent to a "control-click" in MacOS) on these buttons displays the menu. Matrix - Enables isodose plotting, popup menu selects dose matrix size. 90 X 90 - Low resolution (fastest). 120 X 120 - Medium resolution. 180 X 180 - Standard resolution. 270 X 270 - Better resolution. 360 X 360 - High resolution. 540 X 540 - Higher resolution. 720 X 720 - Maximum resolution (slowest). Lines - Enables isodose lines, popup menu changes labeling properties. Tint - Enables isodose areal tinting, the popup menu adjusts tint opacity. Slider - adjusts isodose tinting opacity. Isodose labels spacing slider (S) - Interactively adjusts the location of isodose labels before any shifting required to prevent overlap. 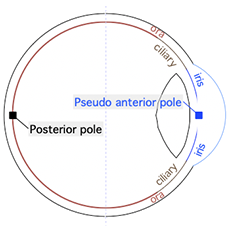 Isodose labels clustering slider (C) - Isodose labels on the retinal diagram gravitate towards the posterior pole but are not allowed to overlap. This slider interactively adjusts the allowed proximity between isodose labels. Isodose labels font size slider (F) - Adjusts the font size of isodose labels. Calc. 2D Matrices - Convenience button to recalculate all 2D matrices and the dose histogram. Same as clicking Calc. 2D Matrices in the Dosimetry Menu menu. Opens the Window Size Dialog dialog. Reduces the diagram size by a factor of 2. Enlarges the diagram by a factor of 2. Resets the diagram to its standard settings. This pop-up menu displays and selects isodose plotting units. Selects the standard posterior pole centered retinal diagram. Selects the alternative anterior oblate hemispheroid azimuthal equidistant projection.